Our Children is a half hour talk show that airs 4-6 times a year on our new day and time, Sundays at 12:30 p.m. on WSVN 7. Taped in Miami-Dade County studios, segments focus on issues, programs, and services of critical importance to families with children. 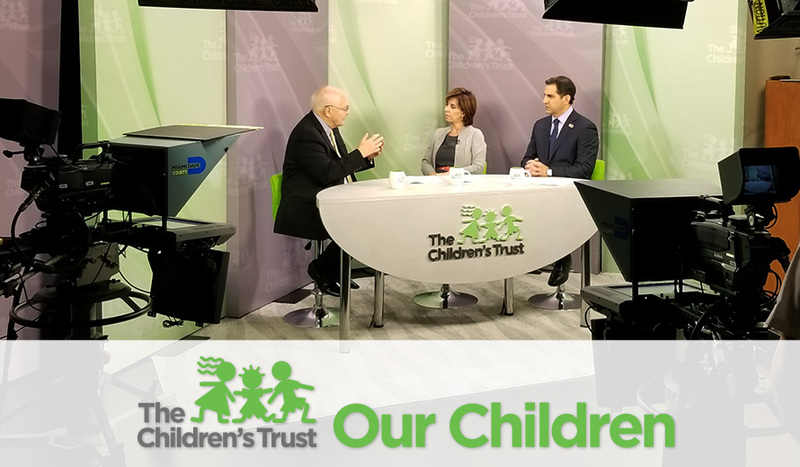 The hosts are James R. Haj, president and CEO of The Children's Trust, and Ileana Varela, from the Herbert Wertheim College of Medicine at FIU. March 10, 2018 - Airing at a special time of 1 p.m.
• An update from Flora Beal at Our Kids about the latest Miami Heart Gallery photo shoot at Zoo Miami and current efforts to promote adoption. • Earl Maulding from Actors' Playhouse provides insight into this year's Young Talent Big Dreams competition. • Details about Thrive by 5, the Trust's new initiative to help ensure children are ready to start school. November 4, 2018 - Airing at a special time of 1 p.m.
• Miami Book Fair is November 11-18 and we’re sharing all the must-see events! From school safety to school choice and a preview of the largest back-to-school resource fair in Miami-Dade County, The Children’s Trust Family Expo. Plus, how participating in #Read30 will keep your kids on top of their academic game all year long. Recognizing the unparalleled achievements of local trailblazers who are improving the lives of children and families in Miami-Dade County. From summer camps to summer jobs; increasing your child’s vocabulary to make them star readers; a preview of our summer #Read30 campaign; and the results of the countywide Young Talent Big Dreams competition! Teaching our teens about leadership through civic engagement; offering youth opportunities to shine through the Young Talent Big Dreams competition; and helping young children learn about black history with top picks from Miami Dade County Public Libraries. Episode descriptions are available on our YouTube Channel under each video. Visit our YouTube Channel to view our entire library of Our Children episodes. Reach families by advertising on or becoming a sponsor. Revenues will help underwrite the program and make it possible to increase the number of programs produced. The first show reached 12,500 households. Expand your reach as our viewership grows. Download rate cards for advertising and sponsorship opportunities. If you have any questions please contact Sandra Camacho at sandra@thechildrenstrust.org.